Maclure Road Mennonite Cemetery, Abbotsford, BC. The Maclure Road Mennonite Cemetery Society was founded by a group of Mennonite and Mennonite Brethren congregations in the Abbotsford-Matsqui area in order to provide Mennonites with a common cemetery. Prior to the founding of the society, burials were scattered among many small church grounds. Civic officials wanted to organize the practice of burying kin, and decided the appropriate solution would be to donate land for a cemetery where all the Mennonite people could be interred, and certain restrictions could be enforced. A site along Maclure Road was made available by the Matsqui municipality to be administered by the churches as a Mennonite section. As a result, the Mennonite Hazelwood Cemetery Organization was founded on 4 May 1951. Since the municipality owned the land but did not receive the revenues, they became apprehensive that after the site was filled, the municipality would have to assume the cost of perpetual care. They therefore suggested that the group of churches take over the cemetery with all rights and duties or return the operation to the municipality. The churches decided that they would like to retain the Mennonite section and since the organization could not hold title to the land it was decided to form a society. The Mennonite Hazelwood Cemetery Society was incorporated on 20 December 1966 with eleven churches participating. The land was deeded over on 23 February 1967. Of the 9.3 acres received, 4.7 acres had been surveyed and divided into plots on the master plan as of 2008. On 12 November 1992, the Mennonite Hazelwood Cemetery Society changed its name to Maclure Road Mennonite Cemetery Society. The cemetery is administrated by a board of directors consisting of one representative from each of the sixteen participating churches. These representatives are elected by their church and volunteer there services. The board elects the officers and employs the manager. Presently, it engages a CGA for accounting services and a local legal firm for legal matters. Elections are held annually. 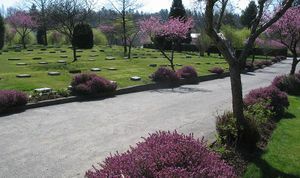 The operation of the cemetery is governed by the British Columbia Public Utilities Commission, the British Columbia Cemetery and Funerals Services Act, the Cemetery By-Law of the City of Abbotsford, the Societies Act, the Privacy Act, and finally, the by-laws of the Maclure Road Mennonite Cemetery Society. Perpetual care and operational funds are deposited locally and comply with legislation. Address: 33965 Maclure Road, Abbotsford, BC. Hiebert, Rudy. "Maclure Road Mennonite Cemetery Society (Abbotsford, British Columbia, Canada)." Global Anabaptist Mennonite Encyclopedia Online. July 2008. Web. 19 Apr 2019. http://gameo.org/index.php?title=Maclure_Road_Mennonite_Cemetery_Society_(Abbotsford,_British_Columbia,_Canada)&oldid=140206. Hiebert, Rudy. (July 2008). Maclure Road Mennonite Cemetery Society (Abbotsford, British Columbia, Canada). Global Anabaptist Mennonite Encyclopedia Online. Retrieved 19 April 2019, from http://gameo.org/index.php?title=Maclure_Road_Mennonite_Cemetery_Society_(Abbotsford,_British_Columbia,_Canada)&oldid=140206. This page was last modified on 8 November 2016, at 22:45.